Everyone loves a good mystery. Throw in glamorous players, far-away locales, and of course, exquisite and stunning gems, and you have a story that will garner rapt attention. But, these aren’t just stories, they are open investigations, dedicated recovery missions and extensive inquiries for the most famous and well-known diamonds that the world has ever produced. While we are lucky that some of these stones are on display for our enjoyment, or even for sale, some have simply vanished and their whereabouts unknown. All we can do is wait for them to pop up at auction some time. Royalty… movie stars… a curse… you can’t make this kind of story up. It is said that the 24.04 carat pear-shaped canary yellow Moon of Baroda was part of the treasure of the Maharajas of Baroda, the royal family of Gaekwad, for over 500 years. History tells us the diamond was then sent to Empress Marie Thérèse of Austria, the only female monarch of the Habsburg dynasty, in 1787 by the family, but it was later returned. In 1860, the diamond was fitted into a necklace at the request of the Maharaja of Baroda, but was sold to an unknown buyer in the early 1920s. It then reappeared on the world stage when it was purchased by Meyer Rosenbaum in 1943, and was displayed in an exhibition in 1944. 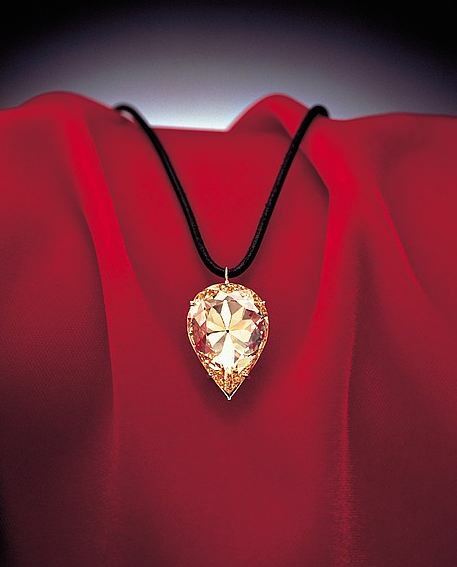 In 1953 the diamond made its glorious Hollywood debut, when Marilyn Monroe (below) wore the gem for the film Gentlemen Prefer Blondes, singing her most famous song, “Diamonds are a Girl’s Best Friend.” During the promotional campaign of the film, Marilyn wore the Moon of Baroda, the largest diamond she ever wore in her lifetime. The Moon of Baroda was not seen again until 2008, when it was displayed publicly by the Antwerp World Diamond Centre. In 2012, a Japanese appraisal television program featured hat was claimed to be the Moon of Baroda, where it was authenticated as the diamond and appraised for $1.9 million. However, a number of replicas of the diamond have been made and put on display. The true location of the Moon of Baroda is unknown. It is often whispered that the Moon of Baroda brings back luck to the owner if it is carried across the sea… we’ll let you decide. Information and images courtesy of the Antwerp World Diamond Centre. No comments yet. Be the first to add one below!